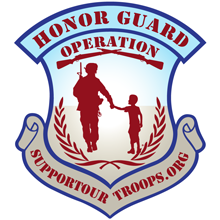 Operation Honor Guard™ has been created by Support Our Troops® to assure that the proper dignity, respect, and gratitude are given to fallen American soldiers and their families during military funerals. On March 2, 2011 the Supreme Court in Snyder v. Phelps, et al, 131 S. Ct. 1207 (2011) , ruled that the First Amendment protects the right of ne'er-do-wells to visibly and audibly protest in the face of family members at the funerals of their beloved sons and daughters who have recently died in military service to us and our country. Thankfully, this freedom of speech also applies to those of us who wish to politely and properly honor the life of these fallen soldiers and their families by delivering in positive manner the respect and gratitude due them during this time of bereavement and loss. Therefore in honor of Marine Lance Corporal Matthew Snyder, and all those like him whose sacrifice has been so disrespected, and in support of the valiant battle that his parents fought on behalf of Matthew and his fellows, Support Our Troops® has created Operation Honor Guard™. In this program, SupportOurTroops.Org will arrange, and if need be fund, the expenses of local high school bands to line the roadside in full uniform, each member with a small American flag on their band hat, softly playing wonderful traditional American songs as the family arrives for the funeral, as well as during the proceedings and the departure. SupportOurTroops.Org will also arrange for the necessary permits and all necessary instructions for the band. How You Can Help Please help fund our positive, supportive programs by donating. Just as these fallen soldiers have sacrificed to guard and protect us and our families, awesome American youths with the wisdom to appreciate that can now stand in the gap to honor and guard the dignity of the funeral ceremony by protecting the family from interruption and pain, while honoring the memory of the lost soldier. This is especially important due to the undesirables who, acting for their own personal gain, have shamelessly and selfishly sought to intrude upon a painfully private and tender moment meant only for family and friends. Operation Honor Guardïƒ” is meant to insulate the family, to whom America owes so much for what they have given, from any undue and unwarranted negative distractions caused by unwelcome visitors. They don't need a confrontation. They don't need a circus. They need the positive support that a program like this affords. It assures that what these families mostly see, and in the background softly hear throughout the ceremony, are Americans who appreciate and respect them and their lost loved one.